This is a feature in which we will go back in time and remember all the late nights we stayed up playing video games with our eyes burning and all buzzed up on pop. It was always "one more game", and for that, we honour these classics with a review. 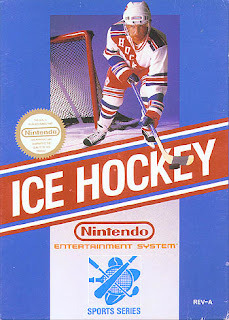 I can remember the first time playing this game and thinking it was the greatest hockey video game of all time. You had Fat Guys that could take slapshots from center ice and it would go top corner, little Skinny Guys that could fly around the ice like Pavel Bure, and you could even control your goalie. Ice Hockey was one of those games I would always try and do real NHL goals in. 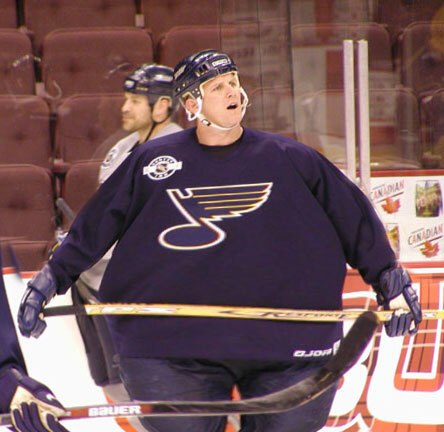 I would take a Skinny Guy and go around the net for a wrap around, or set up my Fat Guy for a one timer. None of this ever worked, but I spent less time doing homework and more time trying to score these ways. This was also the year in school I was sent to the reading clinic. 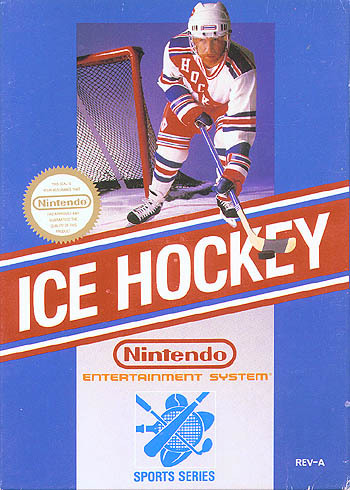 Ice Hockey's replay value was off the charts as you could play this game for hours trying out different teams and combinations to see which line was the best to use. I always loved playing as Canada, but didn’t understand why they were green. All the teams were the same, as you just picked your own players, so Canada was the same as Poland. Japan also had a team in the first edition of the game just because it was released there. The North America release had Sweden instead of Japan. I don’t know why Poland was in the game. I guess the game programmers thought they were the next up and coming hockey superpower. The game can be played in three period lengths: seven, ten or fifteen minutes. The game is played with four skaters and one goalie. This makes the game difficult because the user has to play as the goalie while at the same time controlling their skaters. This game is pretty old school, so the only features you can really do during the game are hit, pass and shoot. Though there are two blue lines and the red center line, offsides are not called, though the ref will call icing. There are virtually no penalties called on players with the exception of fighting. The losing team of a fight will get the penalty. I would love this rule to be brought up at the next NHL general managers meeting. If the game is tied then a shoot-out is held. If there is no winner in the shootout, the game goes to an overtime period with no goalies until the game is won. Another idea for the next GM meetings? Fat Guy: The Fat Guy is slow, but powerful. He can easily knock over other characters and steal the puck, and he has extremely hard shot. His only disadvantage is his slow skating speed and is brutal at faceoffs. Skinny Guy: The Skinny Guy is extremely agile, but is extremely soft. The puck can easily be stolen from him when other players knock him over. His shots are the weakest, but Skinny Guy is the best at faceoffs. Normal Guy: The Normal Guy is average. He is relatively fast and powerful, but is not as specialized as the other characters. Think Dominic Moore. I always like going with 2 Fat Guys that can shoot and a Normal Guy to beat the fat guys to the puck and then a Skinny Guy just to zip around the ice. What line did you like to start? The goalies look like they are wearing welding masks. During the 2nd intermission some dudes also wearing welding masks drive around on tractors cleaning the ice. To get in a fight you need to get in a little shoving match with the opposing player and both of you have to be hitting each other and rapidly pressing the button. The background fans just keep turning there heads back and forth and if you were on shrooms this could be fun to watch. There are no stats for the game and you can only play one game at a time. So if you wanted to do a season you would have to write all the stats down with a notepad. The referee is blue and looks like a smurf, or just has a bad case of frostbite. The same music plays over and over again all game long. After a win your team does this fun little victory lap around centre ice. I would like NHL teams to start doing this. I played this game last week on the Nintendo Wii. You can buy it for 5 bucks now on the Wii Network. I dominated my friend Lisa 11-4, even with her crazy cat trying to bite my feet. Very solid old school game. But then blades of steel came out and blew it out of the water! Better than watching the Leafs! I would rather play any 1980's video game then watch the leafs. skinny, medium, medium, fat. I rarely lose a game with this combo.